Former Indian cricketer turned cricket administrator Rahul Dravid will now play a crucial role in shaping the future cricketers of India. The batting legend will now have the responsibility of running the prestigious and all important National Cricket Academy (NCA), reported the Times of India. ICC Cricket World Cup 2019: India One of the Favourites to Lift the Trophy, Says Rahul Dravid. The coach of the Under-19 World Cup winning cricket team, who is an inspirational figure for upcoming cricketers, will not just lead the NCA but also develop the coaching facilities of the center. 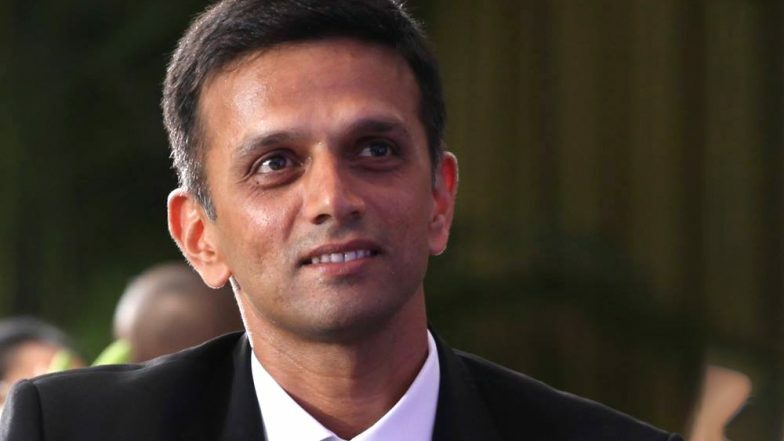 Rahul Dravid Suggests 'Life Coaching & Training' to Help Upcoming Cricketers Find Alternative Career Options. Though the official word is not out yet, the buzz around the cricket fraternity in India is strong that 'The Wall' is taking over the NCA and for good reasons. The Times of India quoted a source saying that Rahul Dravid has been handling "junior cricket for a while now and the results have been phenomenal." The source said that Dravid leading and getting involved deeply with the affairs of the NCA was only a matter of time. "Dravid is determined to bring about a complete turnaround at the academy," he said. The NCA will undergo a complete makeover and will function with under a new structure. The major recommendation and first chance to be introduced by Dravid at the moment is that NCA will accommodate more cricketers and young cricketers will play more matches as that's the best way to learn the basics of the game. Dravid will report to Saba Karim as Karim is the Board's General Manager (Operation), reported TOI.